Hopefully the situation I blogged about last night will now improve. I don’t like writing “woe is me” posts, I try and be a “glass half full” gal, but when your child is anxious to the point that she’s hurting herself, it’s time for action. I’ve written before in D’s home-school diary about the “bullies” (D’s word for them, mine would be less fragrant! ), mentioned it at parents evenings and nothing improved. Today though, the other party has been spoken to and has been told that there will be consequences if this continues. Which is a step forward. Obviously we all encounter people we don’t like and who don’t particularly like us, it’s human nature. But when there are children involved, children who are prone to anxieties, others need to understand how their (not particularly nice) actions are received. And …. D told me she used her “stop it” voice today. She was worried that it might not have worked, that she may have to use it again, but the fact she has once is a definite step forward. My “stop it” voice came out today too after witnessing first hand outside school an action against D.
Like I say, time will tell. I’m going to trust that between D, school and me we’ve sent a message out. 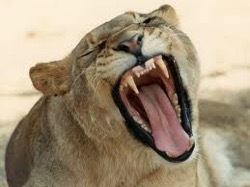 I’m going to stop metaphorically roaring for a while and try purring instead because roaring (metaphorically or otherwise) can get quite tiring after a while.